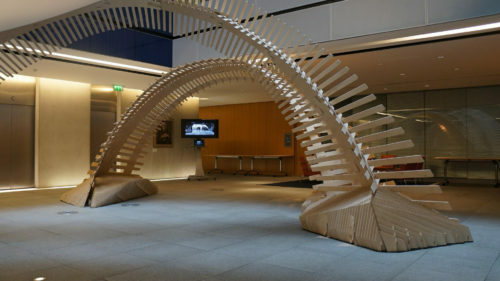 Fingers Crossed is a form-active structure designed by the Emergent Technologies & Design Programme (Emtech) at the Architectural Association School of Architecture in collaboration with Arup, TRADA and Hanson Plywood for the London Design Festival 2014. Built from 9 mm birch plywood & relies solely on friction, rather than metal connections, as a joining solution, Fingers Crossed both exploits & celebrates the material behaviour of wood. 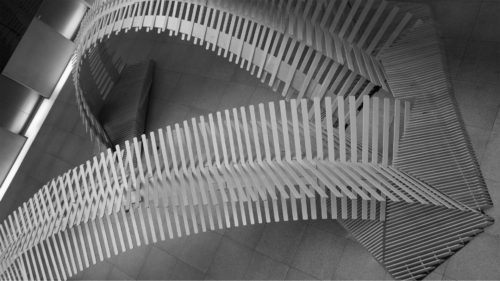 The project, initiated as a collaboration between students of architecture, professional engineers & the UK’s leading timber authority, seeks to express the bending capacity & joinery possibilities that timber provides by integrating structural & spatial performance into one elegant architectural solution. 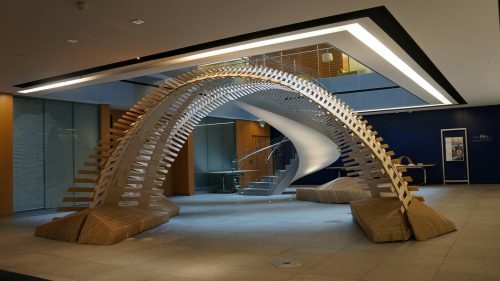 The design was conceived through a week-long ideas competition, where students in the Emergent Technologies and Design Programme developed strategies and systems for the manipulation of plywood sheets into doubly curved surfaces, assembled with a minimal amount of metal connections. The pavilion has been developed iteratively, from digital models to various physical models at different scales. 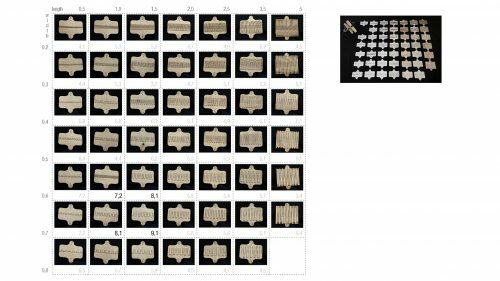 Digital modelling allows for initial geometric investigations, informed by rigorous physical material testing. This landscape, providing seating for visitors and organising circulation through the space, also performs structurally, lending stiffness at the base of the arch by locking it in place. Parametric modelling was used to achieve a feedback loop between geometrical and material studies and structural analysis provided by Arup structural engineers to design a pavilion with varied lighting effects and a playful, interactive landscape. 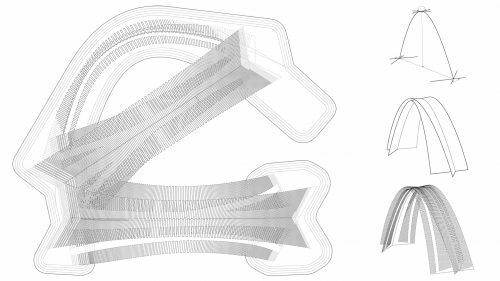 Parametric modelling provides feedback between geometrical, material and structural exploration resulting in variable finger patterns that interlock to create a series of articulated arches. 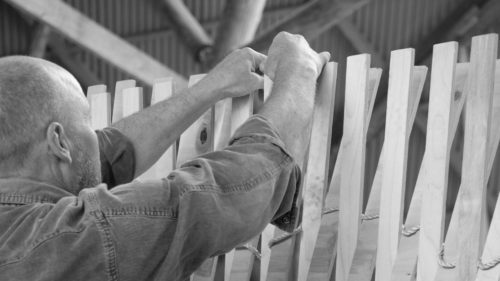 Using both material and digital computational techniques, various methods were tested and prototyped, ultimately ending in the proposal of plywood sheets CNC-milled with a variable finger pattern, joined together to create a series of articulated arches. Along with the design of the pavilion, the construction logic is conceived by the students in such a way that the structure can be assembled and disassembled in one day and transported as a flat-packed package by lorry.